Today customer satisfaction is widely discussing and analyzing because all organizations want that their customers would be satisfied and fascinated. Numerous theoretical and empirical studies show a positive relationship between customer satisfaction and plenty of factors that influence that. Moreover, not all organizations, their staff and managers know how to achieve the key driver – customer satisfaction. So this paper takes a look how many of scientists describe the concept of customer satisfaction, and which factors this conception contains the most. Finally, other purpose of this paper is to present why customer satisfaction is so important goal for each organization at the present when the competition is strong and everlasting and despite this fact all want to round up more satisfied customers as far as possible. Nowadays customer satisfaction is one of the key goals in both smaller and larger organizations. In service sector it is exceptionally important because customer satisfaction is probably the main “key” to a successful business, recognition and retention of customers because service processes more or less involve the customer. Companies look for ways to find out customers desires but at the same time want to ensure their satisfaction with services. Therefore it is very important to clarify not only the most important determinants of customer satisfaction on services but also explore which of them are the most effective. So the main issue of this work is to find out the main conceptions and factors of customer satisfaction on services and its importance for organizations. may be expressed before the product / service selection, the choice of consumption, after a long experience of using. customer satisfaction is defined as the presence and experience in service delivery. All this summarized the author offers to describe a customer satisfaction as an emotional response to what the customer expects to receive before the service and how it assesses the customer when he/she has already received. Meanwhile, as Hill et al. (2007) cited in their book, perhaps the clearest and best definition was told by American marketing expert Philip Kotler: “If the service meets the expectations of the customer is satisfied and, if exceeding the expectations of customer remain highly satisfied; well, if the result does not meet expectations, then the customer remains dissatisfied, without exception, the service”. So this concept can be seen in the fact that customer satisfaction remains the ultimate sentence if the service or the future of its rates of use, content. However, the authors consider that customer satisfaction is in no way be confused with quality of service. First of all, customer satisfaction is a broader concept than service quality. Secondly, the service must be tested to give a final opinion on it. For example, it is possible that some people form an opinion about the hotel service quality, service, staff work and so on from advertising, reputation or communication “word of mouth”. However, in this case, it is impossible to form a satisfaction or dissatisfaction with hotel services in their own field testing. Third, customer satisfaction is much more subjective and emotion-based phenomenon than the quality of service. Finally, Hill et al. (2007) conclude that customer satisfaction or dissatisfaction is based on the experience and feelings that the client felt through contact with an organization. Grigoroudis and Siskos (2010) add to table some definitions which show the main points between satisfaction as an outcome and satisfaction as a process (see Table 1). So in theory it‟s quite easy to describe the concept of customer satisfaction on services: if the service does not meet expectations, customer is disappointed, but if the service meets the requirements of the customer or exceeds all their expectations, then the customer is very happy. Eventually, most of authors believe that this concept holds a lot of keywords (attitude, emotions, humour, consumer loyalty, their relationships and experience, attention, enjoyment, quality of service, maintenance, etc.). But perhaps all of them points out that customer satisfaction might be characterized the best in two ways: satisfaction as a result and satisfaction as the process of services. As mentioned previously, basic and essential key factor which helps to save customers in organizations is satisfaction (Baraškina and Kreišmanė, 2006). Satisfied customer last longer, buy more and more companies develop new services, positively impacting the company and its offerings, less attention to competitors‟ advertising, not as sensitive to price changes, while also providing new ideas for the company. Therefore every organization must continually monitor if their customers are satisfied. Bagdonienė and Hopenienė (2005) point out that one of the most important determinants of customer satisfaction – quality of service. Dulskis (2010) identifies the following consumer satisfaction factors: service provision, its quality; accessibility; the delivery rate (efficiency); professionalism; informative service; understanding the customer; friendly staff, their attitude and attention; the physical environment. So we see that one of the key customer satisfaction factors – consumer awareness, perception, and attitude. Jonikas (2010) believes that user satisfaction depends on the established relationship with the service provider. The author argues that the value of customer service is not just a service, but also the relationship between the company‟s employees, its image, as energy costs. We can see that Dulskis (2010) singled out customer satisfaction factors, so for companies it is important to see and evaluate the delivery efficiency, the staff friendly attitude and environment. Banytė (2009) describes factors of satisfaction such as availability of services (or a lot of time it takes to receive, book a service, or need to travel far to the salon and so on); service quality (70 % it depends on the human factor, for example, from staff). Good service can offset the higher price or to prevent the further sale. Some customers may buy more expensive services simply because it can buy closer to home, but rather a link to go to another end of town to get a full story, details about the service and friendly service. Banytė (2009) and even other authors (Bitner and Zeithaml, 1996) add that in addition to the satisfaction of all of these factors is the price of the service (for some particular satisfaction is caused by a low price), as well as the situation (for example, a customer rushes, comes after an unpleasant incident or is in a good mood and so on), personality of customer (for example, a customer always tend to be humble or on the contrary – always tend to find deficiency or defects). Thompson (2002) in his article briefly and clearly describes the seven key factors that contribute to customer satisfaction on services. So the author refers such factors as the interaction face to face, informative, helpfulness and good service, attention to details, clearly structured service behaviour (in order not to send the client to a couple of other crews and so on). According to Thompson (2002), perhaps it‟s the most important because customers tend to be very disappointed if organization not fulfils their expectations. Of course, there are mistakes, misunderstandings, for example, crashing technique and did not come on time reports, letters, contracts, etc., but Vengrienė (2006) believes that you can always “expiate” the situation of being apologetic, providing free services or financial incentives as well as other small gift benefits. Therefore, both serving staff and the company should as far as possible to correct mistakes or failure, also to fulfil promises because most problems have been solved long remember so when organizations do it wrong it doesn‟t leave an impression, the more – satisfaction on services. Also, the authors Hill et al. (2007) consider that the customer satisfaction depends on staff satisfaction. As interpreted by the authors, the staff is proud to provide services with a good mood, enthusiasm (passion) and only then they do the best in their job. 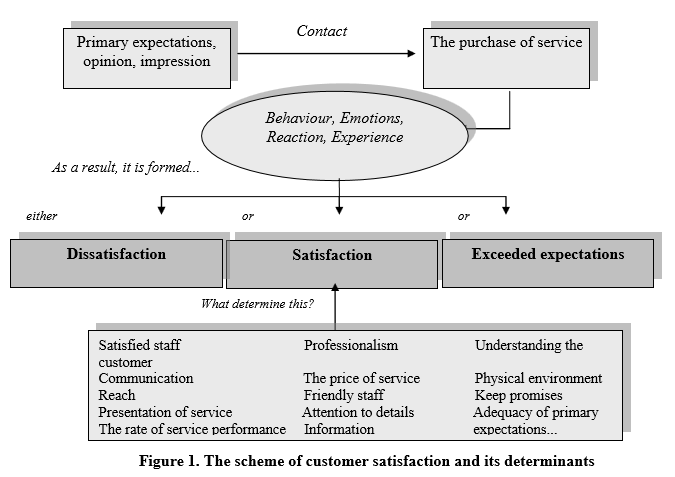 Thus, overlooked a number of both foreign and Lithuanian authors opinions, I have concluded my own perception of customer satisfaction and made the scheme which clearly shows the relation between the customer satisfaction and its factors (see Figure 1). It‟s quite easy to explain the scheme. First of all, regardless the service is used or not at all, or just waiting for the first experience, often a person has formed an opinion about the service. Well, then, of course, the customer meet the staff during (first) contact and if it‟s necessary, contact goes on during the process, the purchase of service. Then doubtless even after the customer experience it is formed, developed some emotions, feelings, reaction to what is got and depending on the situation – positive or negative. So as a result, on my mind, the customer is either dissatisfied, or satisfied (if exceeded all expectations and more – highly satisfied) on services he/she got. Finally, the scheme and analysis was based on literature but, on the other hand, it helped to form a clear view about what leads to customer satisfaction, what are the key factors of that. 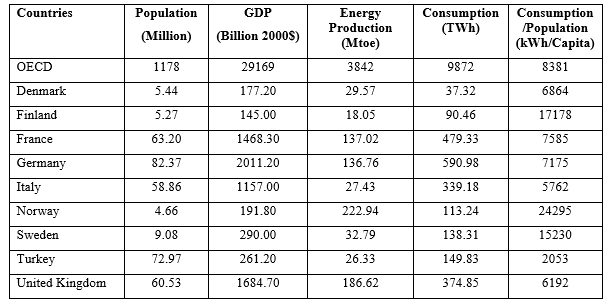 In the list (what form the satisfaction) there are shown mostly discussed aspects, determinants. However, it is possible to continue the list and add more features because the satisfaction is a subjective thing. After all some people like one aspect, others need opposite things so everyone has different view, need and expectations. That‟s why there are left suspension points in the list. In conclusion, after summarizing the number of authors‟ opinions, observations, it might be stated that researchers practical observations and studies have shown that the most important factors underlying customer satisfaction on services and services is quality, informative, customer understanding and pleasant. So it‟s very important to evaluate the behaviour of customers and do regular satisfaction surveys in order to continue long term relations between customers and service organizations. After discussing the concepts of both customer satisfaction and the most important determinants to keep consumers satisfied it is left to find out the importance of customers satisfaction on services. As one of the most frequently mentioned reasons why customer satisfaction is so important for companies on services is a consumer loyalty. Singh (2006) considers that each organization becomes more flexible to the needs of its customers by offering alternatives to exclusive offers. Bagdonienė and Hopenienė (2005) argue that loyal customers are the most effective promoters of the organization of services. After all, the longer company is able to keep the consumer at the same time, it also receives and higher profits. Complementary to Bagdonienė and Hopenienė (2005) opinion, the authors Bakanauskas and Pilelienė (2008) suggest that satisfaction is directly exposed to customer intention to purchase again. It determines not only the consumer‟s purchasing behaviour, but also airborne communications positive “word of mouth”, which is also important to service organizations. Expressing similar views Vavra (2002) considers that some content to the service customers is not only long-term clients, but also to spread positive information and feedback their experiences to others, potential customers, perhaps encouraging them to try the service. Satisfaction saves or completely eliminates the negative communication from “word to mouth”. The author adds that more than 90% dissatisfied customers do not make any effort to the company of their complaints, but simply share their negative experiences with potential customers. In other words, according to Singh (2006), when satisfied customers share their experiences with around five to six people, while disappointed with the ten ones. By the way, today communication spread faster and further than ever before, because most companies operate online, target online communities, etc. So therefore the importance of customer satisfaction is particularly important for service organizations (Vavra, 2002). Authors Hill et al. (2007) believe that organizations with more satisfied customers tend to have a better reputation and gain more confidence. Bagdonienė and Hopenienė (2005) note that the more satisfied staff is the more listens to the needs of customers, creatively eliminates problems and assumes more responsibility. It could be said that the relations between customers and staff (or organization) have a direct connection (this is called the mirror effect). Thus, the organization is interested in moral and increase staff satisfaction and developing loyalty. In addition to loyalty, positive communication “word of mouth”, reputation and staff satisfaction, Grigoroudis and Siskos (2010) list a few more arguments why customer satisfaction today is so important. Firstly, it is noted that customer satisfaction can reliable realistic market information. In this case, the organization has an excellent opportunity to assess the current situation and develop plans for the future. Secondly, the assessment of customer confidence in each organization‟s easier to understand customer behaviour and analyze their customers‟ expectations and desires. Summarizing all these factors, it might be said that customer satisfaction has a significant importance and value of each company providing the service. After all, satisfied with the service customers not only respond good words to potential clients, recommend to try organization‟s service, but also good feedback on service increase profits and bring more loyal customer, so as we see it‟s important and needful to explore the behaviour of consumers and their needs, which is very important to every organization nowadays. So Vavra (2002) argues that before almost two decades ago usually one of the most important factors for companies would become a trademark of reputation, profits and so on. And no one paid so attention if their customers where happy, satisfied or disappointed. So the authors revealed which factors are essential in determining whether the customer is satisfied or not, also helped better understand how is important to evaluate the satisfaction. Finally, how ideas generalized Jonikas (2010), he claimed that it‟s not enough just to analyze the satisfaction, but it is necessary to search for causes of dissatisfaction. Therefore, the importance of customer satisfaction is strongly dependent on the organization as a service monitor, analyze and take appropriate steps to ensure that customers are satisfied. After all, satisfied customer is tend to be more loyal, more often share satisfied feelings with other people, potential customers and so on. In addition, it is believed that satisfied customers pay less attention to competitors, for example, they do not look at prices, special offers and so on. Simply, it is caused of the reason that they feel happy and satisfied with their permanent service organization. As already mentioned, customer satisfaction is one of the most important factors shaping both business services and other organizations. As a result of customer satisfaction in any case should be assessed, monitored and analyzed. As stated majority of the authors, the definitive ratings reveal the most effective, accurate, significant and, of course, objective information. Nowadays customer satisfaction is one of the most important issues for almost all organizations, especially for service organizations. For this reason customer satisfaction should be analyzed, evaluated and translated into the main parameters. As many authors indicate customer satisfaction is often known in two ways: satisfaction as an outcome and satisfaction as a process of services. The “key” indicators which determine satisfaction is service price, its quality, direct contact with staff, understanding the customer, friendly staff and their attitude and attention to customer, also physical environment and so on. It should be mentioned that those parameters are subjective so for this reason the number of customer satisfaction factors can be continue because of our practice, feelings during (or after) the given service. In this way, also very important for all organizations to know what makes their customers the most satisfied, fascinated. Firstly, evaluation of customer satisfaction is the best way to attract potential customers and make them loyal to organization. Secondly, it‟s the way which helps easier to understand customer behaviour and analyze their expectations and desires. Finally, it helps to raise organization‟s reputation and satisfied customers more respond good words to potential clients. Bagdonienė L., Hopenienė R. (2005). Paslaugų marketingas ir vadyba: Vadovėlis. Kaunas: Technologija. Bakanauskas A., Pilelienė L. (2008). Vartotojų lojalumo stadijų nustatymo modelis. Organizacijų vadyba: Sisteminiai tyrimai. 2008.48. Bitner M., Zeithaml V. (1996). Service marketing. New York: McGraw-Hill. Cochran C. (2003). Customer satisfaction. Tools, Techniques, and Formulas for Success. USA: Paton Professional. Dulskis D. (2010). Vartotojų pasitenkinimo viešosiomis paslaugomis tyrimų metodika ir jos taikymas. Vilnius: Vidaus reikalų ministerija. Grigoroudis E., Siskos Y. (2010). Satisfaction Evaluation. Methods for Measuring and Implementing Service Quality. London: Springer. Hill N., Roche G., Allen R. (2007). Customer Satisfaction. The customer experience through the customer‟s eyes. London: Cogent Publishing. Szwarc P. (2005). Researching customer satisfaction & loyalty. How to find out what people really think. London: Kogan Page. Vavra T. G. (2002). Customer Satisfaction Measurement Simplified. United States: Quality Press. Vengrienė B. (2006). Paslaugų vadyba: Mokomoji knyga. Vilnius: Vilniaus universiteto leidykla.